Attorney Ivan D. Piedrahita, Esq. Ivan D. Piedrahita graduated from Dartmouth College in Hanover, New Hampshire with a Bachelor’s Degree in History and Romance Languages. During this period, he studied at the University of Lyon and the University of Toulouse in France. He also did an internship at the International Labour Organization in Geneva, Switzerland. Thereafter, he attended American University in Washington, D.C., and studied law, graduating with honors. While studying in Washington, D.C., he did a legal internship in the legal department of the Organization of American States in Washington, D.C. 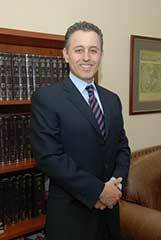 Since 1997, he has exclusively practiced immigration law in Fort Lauderdale, Florida. He is a member of the Florida Bar and belongs to the American Immigration Lawyers Association. He speaks fluent English, Spanish, and French. and convey to them with unparalleled clarity which communities would best fit their needs. The Patel family are proud parents at American Heritage School! As licensed realtors and proud mothers at The American Heritage School, Flavia and Cintia are happy to introduce you to the school, help in the admission process, and answer any questions you may have during this important transition. Flavia and Cintia specialize in residential real estate, have 10 years of experience combined, and also speak Portuguese, Spanish and Italian. They have worked with many families from American Heritage School in identifying a neighborhood of choice, purchasing or renting a home, and adapting to the local lifestyle. Flavia and Cintia's clients benefit from the tools and resources provided by their brokerage, Compass. Compass takes a high-tech, high touch approach to real estate, combining the best agents, transformational tools, and unparalleled marketing and support services in your real estate search. Cassio Faccin PA in partnership with Josi Tsung. In partnership with Faccin Investments Group specializing in the relocation of Brazilian and Chinese families. Faccin Investments Group offers a complete real estate & relocation concierge service to assist you in moving your family to the United States. In 20 years we have assisted more than 100 families successfully relocated to the United States and we would honored to help you as well. Faccin Investments Group is also very proud to be the only real estate to be an official partner of AMCHAM (the American Chamber of Commerce in Brazil) on the project “How to Invest in the US”. Originally from Sao Paolo, Brazil, Cassio Faccin is a proud husband and Father of two set of twins who are also students at the American Heritage school. Our associate, Mrs. Josi Tsung, is an Attorney, born in the United States but raised in Sao Paulo Brazil. Mrs. Tsung now lives in Plantation, Florida with her husband and 10 year old Son, all of them fluent in Chinese. The team from Faccin Investments Group would be honored to assist your family with the process of relocation to the United States. Helping to introduce you to the school, support and assistance during the admission process, helping to resolve issues related with immigration and to help you to purchase or rent a home in South Florida. For your families’ convenience, we have offices in Sao Paulo – Brazil, Shanghai – China, Miami and New York -USA. Dondi Hopkins,Sales ExecutiveWe are a mother/daughter team having sold more than $750,000,000 over a combined 45 year career. Even though we have sold numerous properties throughout Broward County, our areas of specialization continue to include Plantation, Davie, Weston and Fort Lauderdale. We are proud to continue to recommend American Heritage. Linda has been a Realtor for 11 years, working with sellers and buyers throughout Broward and Palm Beach counties. Linda is a consistent top producer and in 2013 was honored as the #1 top producing agent for the Better Homes & Gardens Florida 1st West Broward office. Her commitment to her clients is unparalleled as evidenced by her client reviews on Zillow. As an American Heritage parent and community member, she knows the area and strives to find the best fit for all of her clients. www.bkgrouprealestate.com Brian is the Designated Relocation Specialist for BK Group Real Estate Services at RE/MAX | House of Real Estate. He's a lifelong South Florida resident with extensive experience representing both buyers & sellers. His working territories include Broward, Palm Beach, & Miami Dade Counties. Brian’s client first approach to real estate has consistently earned him 5 out of 5 stars in client reviews. Brian provides all American Heritage parents & faculty members a complimentary one year home warranty at closing when he represents them as their Realtor. Serving the entire Broward/Dade counties with over 10 years of real estate expertise and 25 years of marketing expertise, I understand the need for a quality neighborhood and lifestyle for your family. It is my promise to provide prompt, courteous and accurate service when you choose to buy, sell or rent a residence. Inquire today about my rebate program! of an international aircraft parts company. Rodd serves most cities from Weston to the beaches with an emphasis on luxury home developments. Rodd’s integrity, keen sense of the market, and known skill as a master negotiator, makes him the supreme choice for real estate representation. Debra is a South Florida native who specializes in the communities surrounding The American Heritage school as well as the area's newly constructed homes. She is focused on offering her clients guidance and peace of mind during a dynamic process. Her goal is to create a smooth transition to a new home in the best suited community.